While obviously Rolex makes big splashes every year and had some great new additions to their lineup, Tudor has been steadily growing and has all but taken over the $2,000-$5,000 price range. This year, the Tudor Heritage Black Bay Chrono made waves with it’s really interesting new design. Over the past few years, the Tudor Heritage Black Bay watches have been absolutely on fire. They have a simple design, great price point, and are loosely tied enough to Rolex to make them stand out in a collector’s mind. Everything about them is high quality, and more importantly…they just look great. The Black Bay has been a solid diving watch since Tudor introduced it decades ago, and it has even been compared very closely with the Rolex Submariner. 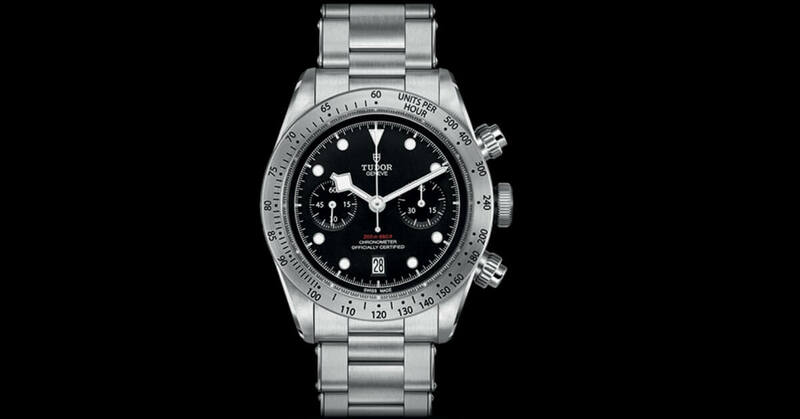 The Black Bay Chrono, however, is something in a totally new direction for Tudor. Rather than just continuing the focus on being a dive watch, the Chrono is essentially a mix of a dive watch and a racing watch. This watch represents some risk taken by Tudor, as it dips it’s toes into the “watch that does it all” category. The new features on the Black Bay Chrono include two subdials at 3 and 9 o’clock, screw down pushers for the chronograph function, a tachymetric scale (very similar to a Rolex Daytona), and a textured black dial. As per usual with Tudor watches, the visibility on the new Black Bay Chrono is great. The black dial contrasts with the iconic “Snowflake” hands nicely, although the end of the hour and minute hands tend to block the subdials at certain points of the day. Another nice feature of this watch is the small date function at 6 o’clock, which is also a departure from the Black Bay watches that we’ve seen Tudor roll out in recent years. Any time a fine watch includes a date function, it immediately becomes eligible for a daily wear in our eyes. The engraved tachymetric scale on the bezel is also easy to read but does look shockingly similar to the one usually featured on the Rolex Daytona. Whether or not this watch should really have a tachymetric scale on the bezel is certainly up for debate, but it is at least well done. The Black Bay Chrono features a 70-hour power reserve, which is definitely impressive. Believe it or not, the Manufacture chronograph Calibre MT5813 is actually shared technology with Breitling. Breitling manufactures this movement, and then Tudor updates it with their own styling, balance wheel, and hairspring. If you’re looking for a watch that does several different things (which goes against the norm a bit in the fine watch world), this is it. You could definitely make the argument that there is just too much going on with this watch, but it’s an interesting experiment by Tudor to say the least. The part dive watch, part racing watch is certainly an interesting departure, and we look forward to seeing how this watch is received over the coming years. The Tudor Black Bay Chrono marks a definite turn for the iconic Black Bay line. The added functionality of a chronograph, tachymetric scale, and date window makes this watch almost a “Jack of all trades” style of watch. If you are interested in purchasing a fine watch from Jonathan’s Fine Jewelers, give us a call or fill out our contact form and a representative will be with you shortly. Check out our Facebook page for box openings and watch reviews by our in-house watch expert Sergio Nuncio!